Uttarakhand Open University (UOU) Haldwani invites applications for the posts of Administrative Counselor and Technical Counselor. 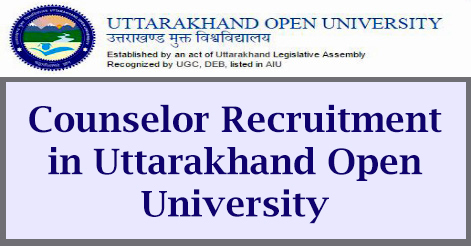 Uttarakhand Open University has released advertisement for the post of Administrative Counselor and Technical Counselor on contract basis for a period of 6 Months. Interested candidates may appear in the walk in on 25 to 26 July 2017.
with Minimum 02 years for M.Tech.B.Tech and 5 Years for MSc in relevant field. Administrative Counselor 04 Candidate should be Graduate and PhD with minimum 55% marks from a recognized university. Selection will be done by Walk In Interview, which will be conducted on 25 to 26 July 2017.. Candidates have to download prescribed application format from the website www.uou.ac.in, under announcement section and complete the application form. They have to appear or Walk In Interview on 25 to 26 July 2017 at Uttarakhand Open University, Behind Transport Nagar, Teenpani Bypass road, Haldwani (Nainital) 263139 Uttarakhand with complete application, bio data and all educational and experience certificates in original and one set of self attested copies. Candidates need to deposite an application fee of Rs.200 in accounts department and obtain the receipt for the same. The Fee Receipt is to be produced during Interview along with the application form. Help us to improve this article/job posting "Administrative & Technical Counselor Recruitment in Uttarakhand Open University". We would be glad if you can comment below and provide your valuable suggestions and feedback. If this page have any wrong information/list or out of context content, then you can report us as well. What would happen after 6 month, Candidate will be permanent or he will continue as a contractor? jz hve done my b.tech in IT in june 2017.
can i apply for the technical counselor. ? ?